Our Modular Top Load Hot Air Dryers are designed to consume minimal floor space without sacrificing drying efficiency. The air in the drying chamber is continuously circulated and reheated, so unlike some dryers that exhaust-large amounts of hot air into the room, these drying systems offer greatly reduced energy costs. 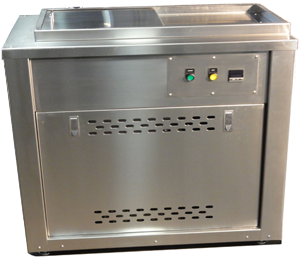 The heated chamber is fully insulated and all components are enclosed in a stainless steel bench. All systems include nominal filtration. HEPA filtration is optionally available. Standard sizes are listed below, custom sizes and configurations are also available. 28" x 20" x 24"
36" x 18" x 30"
40" x 40" x 36"
73" x 40" x 36"
67" x 43" x 36"
*Custom Sizes and voltages available. If you have a unique application that calls for a special drying system, we will be pleased to custom design a dryer to meet your individual requirements. And we can deliver your custom drying system with surprisingly short lead times at very competitive prices.